Honor to the High Priest. The affairs of the Second Temple were managed by a board of fifteen appointed officers ("memunnim"). 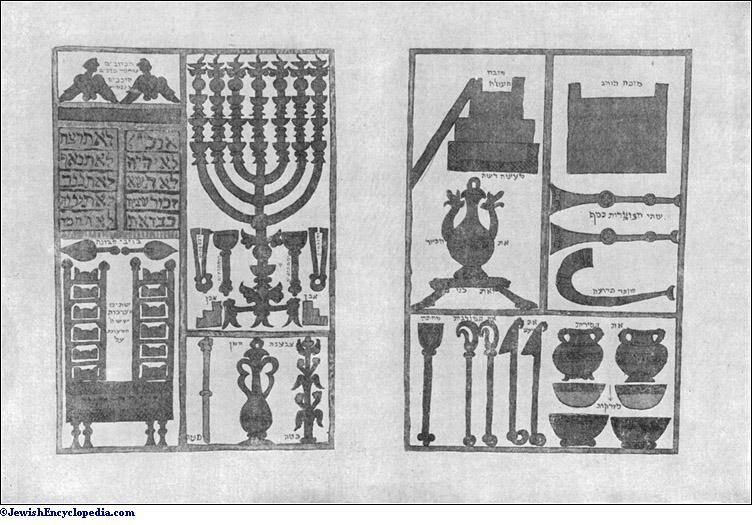 The Mishnah records the following names of officers of the Temple without stating their respective periods of activity; but it is presumed they were those appointed in the time of Agrippa: (1) Johanan b. Phinehas, in charge of the seals given in exchange for money to purchase sacrifices; (2) Ahijah, of libations; (3) Mattithiah b. Samuel, of allotments (i.e., the selection of priests for the day); (4) Pethahiah, of the nests of fowls (for sacrifices); (5) Ben Ahijah, of the health department (treating especially a disease of the bowels caused by the bare feet touching the cold marble pavement); (6) Neḥunya, of the digging of wells (for the pilgrims on the highways leading to Jerusalem); (7) Gebini (Gabinimus), of announcements (the Temple crier); (8) Ben Geber, of the gates (opening and closing them); (9) Ben Babi, of the wicks for the candlestick ("menorah"); (10) Ben Arza, of the cymbals (leading the music of the Levites); (11) Hugras (Hugdas) b. Levi, of the musical instruments; (12) the Garmu family, of the preparation of the showbread; (13) the Abṭinas family, of the incense; (14) Eleazar, of the curtains; and (15) Phinehas, of the vestments (Sheḳ. v. 1; comp. Maimonides, "Yad," Kele ha-Miḳdash, vii. 1). 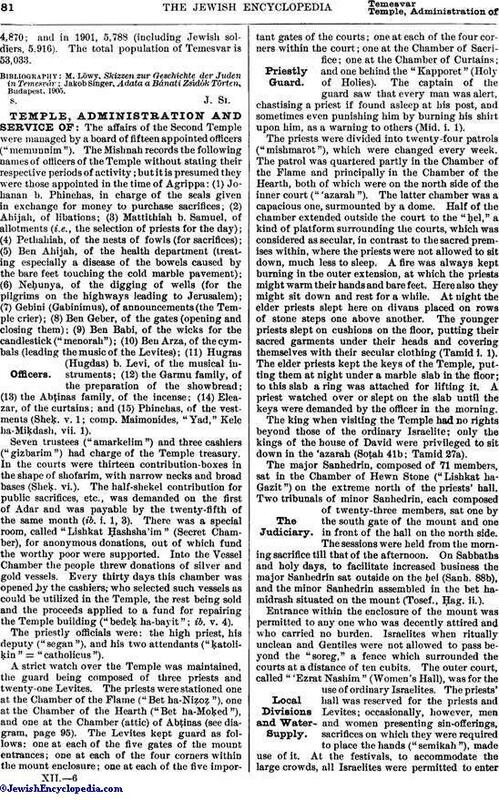 Seven trustees ("amarkelim") and three cashiers ("gizbarim") had charge of the Temple treasury. In the courts were thirteen contribution-boxes in the shape of shofarim, with narrow necks and broad bases (Sheḳ. vi.). The half-shekel contribution for public sacrifices, etc., was demanded on the first of Adar and was payable by the twenty-fifth of the same month (ib. i. 1, 3). There was a special room, called "Lishkat Ḥashsha'im" (Secret Chamber), for anonymous donations, out of which fund the worthy poor were supported. Into the Vessel Chamber the people threw donations of silver and gold vessels. Every thirty days this chamber was opened by the cashiers; who selected such vessels as could be utilized in the Temple, the rest being sold and the proceeds applied to a fund for repairing the Temple building ("bedeḳ, ha-bayit"; ib. v. 4). The priestly officials were: the high priest, his deputy ("segan"), and his two attendants ("ḳatoliḳin" = "catholicus"). A strict watch over the Temple was maintained, the guard being composed of three priests and twenty-one Levites. The priests were stationed one at the Chamber of the Flame ("Bet ha-Niẓoẓ"), one at the Chamber of the Hearth ("Bet ha-Moḳed"), and one at the Chamber (attic) of Abṭinas (see diagram, page 95). 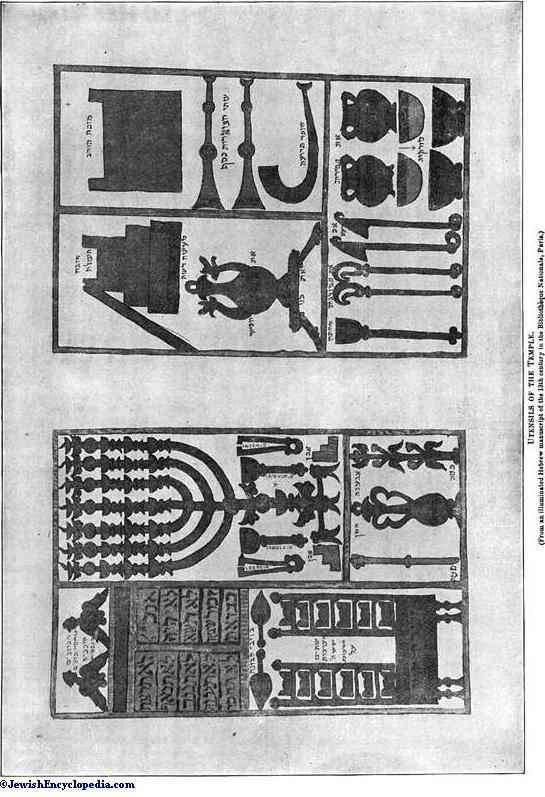 The Levites kept guard as follows: one at each of the five gates of the mount entrances; one at each of the four corners within the mount enclosure; one at each of the five important gates of the courts; one at each of the four corners within the court; one at the Chamber of Sacrifice; one at the Chamber of Curtains; and one behind the "Kapporet" (Holy of Holies). The captain of the guard saw that every man was alert, chastising a priest if found asleep at his post, and sometimes even punishing him by burning his shirt upon him, as a warning to others (Mid. i. 1). The priests were divided into twenty-four patrols ("mishmarot"), which were changed every week. The patrol was quartered partly in the Chamber of the Flame and principally in the Chamber of the Hearth, both of which were on the north side of the inner court ("'azarah"). The latter chamber was a capacious one, surmounted by a dome. Half of the chamber extended outside the court to the "ḥel," a kind of platform surrounding the courts, which was considered as secular, in contrast to the sacred premises within, where the priests were not allowed to sit down, much less to sleep. A fire was always kept burning in the outer extension, at which the priests might warm their hands and bare feet. Here also they might sit down and rest for a while. At night the elder priests slept here on divans placed on rows of stone steps one above another. The younger priests slept on cushions on the floor, putting their sacred garments under their heads and covering themselves with their secular clothing (Tamid. i. 1). 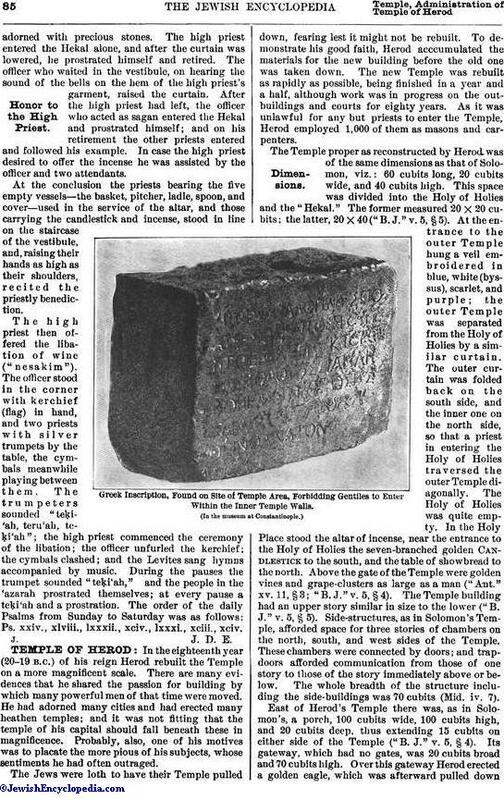 The elder priests kept the keys of the Temple, putting them at night under a marble slab in the floor; to this slab a ring was attached for lifting it. A priest watched over or slept on the slab until the keys were demanded by the officer in the morning. The king when visiting the Temple had no rights beyond those of the ordinary Israelite; only the kings of the house of David were privileged to sit down in the 'azarah (Soṭah 41b; Tamid 27a). The major Sanhedrin, composed of 71 members, sat in the Chamber of Hewn Stone ("Lishkat ha-Gazit") on the extreme north of the priests' hall. Two tribunals of minor Sanhedrin, each composed of twenty-three members, sat one by the south gate of the mount and one in front of the hall on the north side. The sessions were held from the morning sacrifice till that of the afternoon. On Sabbaths and holy days, to facilitate increased business the major Sanhedrin sat outside on the ḥel (Sanh. 88b), and the minor Sanhedrin assembled in the bet hamidrash situated on the mount (Tosef., Ḥag. ii.). Entrance within the enclosure of the mount was permitted to any one who was decently attired and who carried no burden. Israelites when ritually unclean and Gentiles were not allowed to pass beyond the "soreg," a fence which surrounded the courts at a distance of ten cubits. 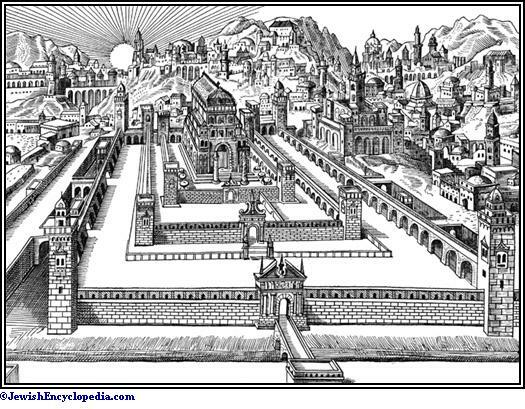 The outer court, called "'Ezrat Nashim" (Women's Hall), was for the use of ordinary Israelites. The priests' hall was reserved for the priests and Levites; occasionally, however, men and women presenting sin-offerings, sacrifices on which they were required to place the hands ("semikah"), made use of it. At the festivals, to accommodate the large crowds, all Israelites were permitted to enterthe priests' hall, on which occasion the curtain of the vestibule was raised to show the people the interior of the "Hekal" ( see Pilgrimage). The people, though tightly packed, were able to find sufficient space in which to prostrate themselves, this being one of the miracles associated with the Temple. The people crowded to within eleven cubits behind the Holy of Holies (Yoma 21a). Another phenomenon was the water-supply. 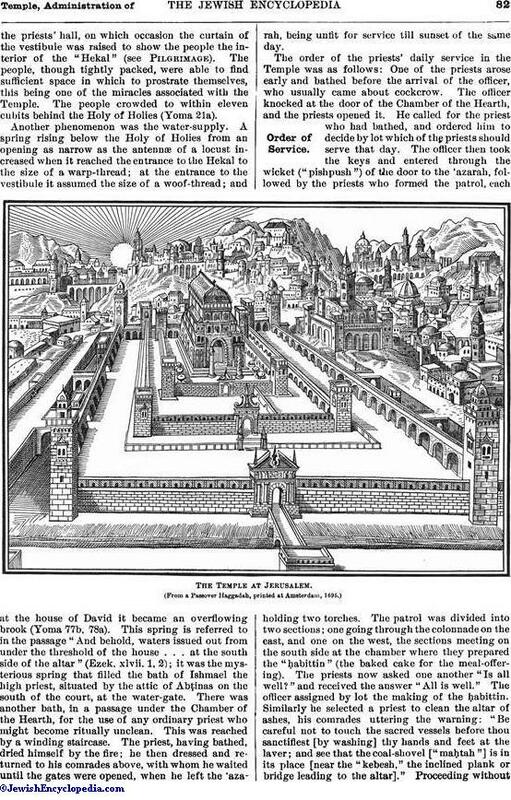 A spring rising below the Holy of Holies from an opening as narrow as the antennæ of a locust increased when it reached the entrance to the Hekal to the size of a warp-thread; at the entrance to the vestibule it assumed the size of a woof-thread; and at the house of David it became an overflowing brook (Yoma 77b, 78a). This spring is referred to in the passage "And behold, waters issued out from under the threshold of the house . . . at the south side of the altar" (Ezek. xlvii. 1, 2); it was the mysterious spring that filled the bath of Ishmael the high priest, situated by the attic of Abṭinas on the south of the court, at the water-gate. There was another bath, in a passage under the Chamber of the Hearth, for the use of any ordinary priest who might become ritually unclean. This was reached by a winding staircase. The priest, having bathed, dried himself by the fire; he then dressed and returned to his comrades above, with whom he waited until the gates were opened, when he left the 'azarah, being unfit for service till sunset of the same day. The order of the priests' daily service in the Temple was as follows: One of the priests arose early and bathed before the arrival of the officer, who usually came about cockcrow. The officer knocked at the door of the Chamber of the Hearth, and the priests opened it. He called for the priest who had bathed, and ordered him to decide by lot which of the priests should serve that day. The officer then took the keys and entered through the wicket ("pishpush") of the door to the 'azarah, followed by the priests who formed the patrol, each holding two torches. The patrol was divided into two sections; one going through the colonnade on the east, and one on the west, the sections meeting on the south side at the chamber where they prepared the "ḥabittin" (the baked cake for the meal-offering). The priests now asked one another "Is all well?" and received the answer "All is well." The officer assigned by lot the making of the ḥabittin. Similarly he selected a priest to clean the altar of ashes, his comrades uttering the warning: "Be careful not to touch the sacred vessels before thou sanctifiest [by washing] thy hands and feet at the laver; and see that the coal-shovel ["maḥtah"] is in its place [near the "kebesh," the inclined plank or bridge leading to the altar]." Proceeding without any light save that of the pyre ("ma'arakah") on the altar, he disappeared below, and was next heard operating the machinery for raising the laver from the well. This consisted of a wooden wheel and shaft and a chain, a device designed by the high priest Ben Ḳaṭṭin. The noise caused by this operation fixed the time for washing hands and feet. The priest took the silver "maḥtah" and ascended the altar; pushing the large coals aside, he took a shovelful of ashes and charred wood, and, descending, turned northward and deposited the ashes in a heap on the floor three handbreadths from the "kebesh," where also the ashes from the golden altar and the candlestick were placed. The authorities disagree as to the disposition of the ashes: some say they fell through a grate in the floor; others, that they were removed later. Observing his act, the priest's comrades hurried to wash their hands and feet at the laver. They then took large shovels ("magrefot") and made a heap ("tappuaḥ") of the ashes of the altar in the center, other priests meanwhile using flesh-hooks to place aside the portions of the sacrifices that had not been consumed during the night. When the heap of ashes was sufficiently large it was removed outside the city. The priests now brought pieces of all kinds of wood except olive and vine, and built a new pyre, on which they replaced the unconsumed portions of the sacrifices. For a second pyre, intended for the burning of incense, they selected the best fig-wood. Having lit the two pyres, they descended from the altars. The officer then ordered the priests to decide by lot who should slaughter the sacrificial victim, who should sprinkle the blood, who should clean the ashes from the golden altar and from the golden candlestick, and who should attend to the sacrifices in detail. This being done, the officer commanded: "Go ye and see if it is time to commence the sacrificial service!" Mounting to an eminence of the Temple, they looked toward the east, till at length one shouted, "Barḳai!" (the morning light has appeared). Mattithiah b. Samuel said they asked him, "Has the light in the east reached Hebron?" and he answered, "Yes." The mention of Hebron was made to honor the memory of the patriarchs buried there. The officer then said: "Go and fetch a lamb from the Chamber of the Lambs" (situated at the northeast corner of the 'azarah). The priests entered also the Vessel Chamber and took therefrom ninety-three vessels of silver and gold. The lamb was now examined by the light of torches to see whether it was free from blemishes; and water from a golden cup was given it to drink. The priest selected by lot then dragged the animal to the abattoir, north of the altar. Meanwhile other priests advanced with the "ṭeni," a gold dish in the shape of a basket of a "tarḳab" measure; the "kuz," a gold pitcher; and two keys wherewith to open the Hekal, one from the outside and one from within through the wicket or lattice of a cell on the north side of the vestibule. The bolt was thrown back and the doors unlocked, causing a noise which was heard a long distance and which was the signal for the shoḥeṭ to slaughter the perpetual morning sacrifice ("tamid shel shaḥarit.") at the abattoir, while the priest in the Hekal carefully gathered up all the ashes of the golden altar into the ṭeni, put this on the floor, and went out. The priest with the kuz cleared the candlestick of ashes, leaving the two lights nearest to the east to burn till the evening. If he found them extinguished he renewed and relighted them, after which he trimmed the other lamps. In front of the candlestick were three marble steps, on the top one of which the priest stood to trim and light the lamps. When he had finished he put the kuz on the second step and went out. On the first step the tongs and snuff-dishes were placed (Maimonides, "Yad," Bet ha-Beḥirah, iii. 11). The ṭeni was removed by the priest chosen to remove the ashes of the altar after the incense had been offered; the kuz, by the priest who in the afternoon attended to the two lights of the candlestick that had been burning all day. The slaughter of the lamb was effected as follows: The front legs were bound to the hind legs, the head pointing south with its face toward the west. The shoḥeṭ stood facing the west. The morning tamid was slaughtered at the northwest corner, that of the afternoon at the northeast corner, of the altar at the second ring. There were twenty-four rings, in four rows, fixed to the floor on hinges; in these the heads of the animals were held in position. The priest who received the blood in a basin stood facing the south. He sprinkled the blood on both sides of the northeast and south west corners of the altar. The removal of the hide and the dissection of the carcass were shared by the priests, and were followed by the meal-offering (Lev. vi. 13). This accomplished, the priests went to the Chamber of Hewn Stone. There the officer directed them to recite one benediction ("Ahabah Rabbah") and to read the Ten Commandments and the "Shema'," after which they blessed the people. On Sabbaths they blessed also with "love, brotherhood, peace, and friendship" the patrol that was about to go off duty. Finally, the priests drew lots for the incense service, and the various assignments were made, only those who had not been previously selected being admitted to the ballot. The priests that were not to share in the service of the day now removed their priestly garments and then, having delivered them to an attendant who placed them in the proper lockers, dressed themselves in their secular clothes and retired from the 'azarah till their next turn. During the sacrifice the Levites were at their stations on the steps leading to the priests' hall, and in front of the dukan; but they did not commence their music until the libation at the conclusion of the service. The musical instrument called the "magrefah," somewhat similar to the organ, stood between the altar and the vestibule. Its tones, which could be heard a long distance, were the signal for the priests to prostrate themselves: this took place after the incense-offering. Special honor was paid to the high priest. He was attended by three priests: one on his right, one on his left, and one holding up the breastplateadorned with precious stones. The high priest entered the Hekal alone, and after the curtain was lowered, he prostrated himself and retired. The officer who waited in the vestibule, on hearing the sound of the bells on the hem of the high priest's garment, raised the curtain. After the high priest had left, the officer who acted as sagan entered the Hekal and prostrated himself; and on his retirement the other priests entered and followed his example. In case the high priest desired to offer the incense he was assisted by the officer and two attendants. At the conclusion the priests bearing the five empty vessels—the basket, pitcher, ladle, spoon, and cover—used in the service of the altar, and those carrying the candlestick and incense, stood in line on the staircase of the vestibule, and, raising their hands as high as their shoulders, recited the priestly benediction. The high priest then offered the libation of wine ("nesakim"). 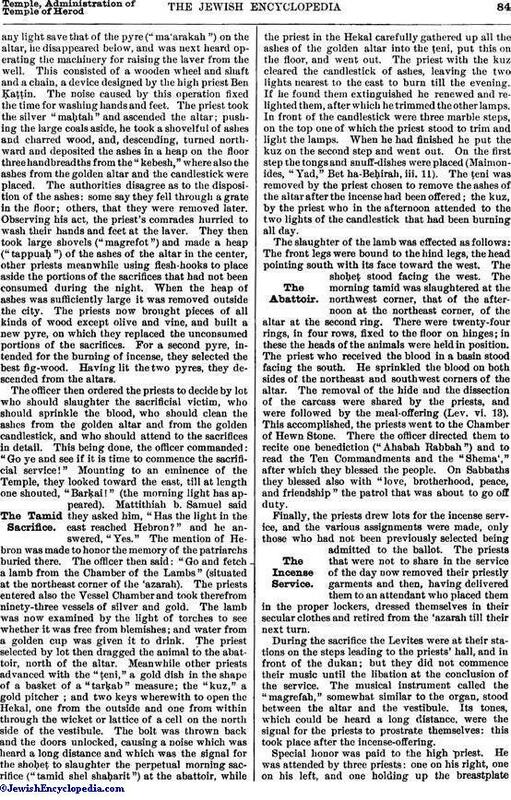 The officer stood in the corner with kerchief (flag) in hand, and two priests; with silver trumpets by the table, the cymbals meanwhile playing between them. The trumpeters sounded "teḳi'ah, teru'ah, teḳi'ah"; the high priest commenced the ceremony of the libation; the officer unfurled the kerchief; the cymbals clashed; and the Levites sang hymns accompanied by music. During the pauses the trumpet sounded "teḳi'ah," and the people in the 'azarah prostrated themselves; at every pause a teḳi'ah and a prostration. The order of the daily Psalms from Sunday to Saturday was as follows: Ps. xxiv., xlviii., lxxxii., xciv., lxxxi., xciii., xciv.